Life Plus Wonder Gel Relief gel for aches pains with Eucalyptus Oil, Aloe Vera, EDTA, . 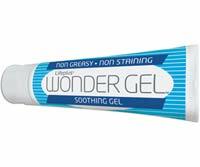 "Wonder Gel - to help ease tired aching muscles!" "...a gentle heat soothing moisturizing gel Wonder Gel." Fast/Easy - Order Yours Now For Only $19.50 - Click Here! INGREDIENTS: Water, Aloe Vera Gel, Triethanolamine, Menthol, Eucalyptus Oil, Camphor, Oil of Wintergreen, Carpobol 980, Peppermint Oil, Methylparaben, Propylparaban, EDTA, Tetrasodium Salt, Sodium Silicate, Tea Tree Oil, Copaiba Oil, Ginger Root Extract, Castol Oil Potassium Hydroxide, Cocamidopropyl Betaine..
WONDER GEL is a gentle heat soothing moisturizing gel to help ease tired aching muscles. It's a fast acting, deep penetrating gel in a water base make it great for massaging into tired muscles. You can wear it under your best clothes and not worry about greasy stains. Wonder Gel is of the same high quality that you've come to expect from Life Plus. Contains no artificial coloring agents, synthetic fragrances or mineral oil. Not tested on animals. Apply liberally as often as needed. May be used with wet or dry bandages or with ice packs.